On Saturday, 4 April, 60 juvenile sea turtles were released into the sunset waters of the Andaman Sea to begin their lifetime ocean odysseys at Laguna Phuket’s 21st annual sea turtle release, at Outrigger Laguna Phuket Beach Resort’s beachfront. More than 400 donors and spectators were all-smiles as they watched the young sea turtles made their momentous journey on Bangtao Beach. 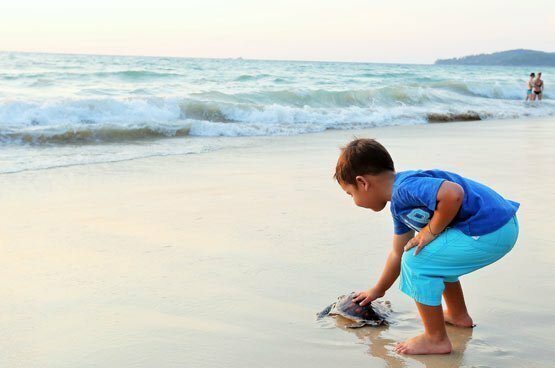 The beach ceremony was part of Laguna Phuket’s on-going environmental partnership with Phuket Marine Biological Centre (PMBC) to help the plight of endangered sea turtles. Instructions were given to all donors by PMBC biologists who were in attendance to closely supervise the release. A total of 530,000 Baht accumulated from turtle ticket sales and other fundraising activities in 2013, 2014 and at this year’s event was presented to Phuket Marine Biological Center (PMBC) to support its ongoing sea turtle conservation programmes in partnership with the Royal Thai Navy. “To date, 1,950 sea turtles have been released at Laguna Phuket’s beachfront and more than 6.5 million Baht raised over the past 21 years,” said Mr. David Seet, Senior Assistant Vice President, Laguna Phuket. “It is also important that more than 3,000 donors have participated in our initiative over the course of two decades as our goal is not only to raise funds but to also raise the awareness. We hope that this experience will encourage our kind donors, especially the young generations, to be lifelong advocates of wildlife conservation and environmental preservation.” he concluded. In previous years, Laguna Phuket has also used funds raised to sponsor 4 satellite tracking devices for juvenile sea turtles as well as reconstruct roof structures for disabled turtle shelter at Phuket Marine Biological Centre, all aiming to enhance the efficiency of sea turtle conservation in Phuket. Green sea turtles (Chelonia mydas) can live for up to 60 years and spend their lives roaming the world’s oceans. Only the females ever come ashore again to nest.